This is my third MLAG post. You might want to read the Multi-chassis Link Aggregation Basics and Multi-chassis Link Aggregation: Stacking on Steroids posts before continuing. Juniper has introduced an interesting twist to the Stacking on Steroids architecture: the brains of the box (control plane) are outsourced. 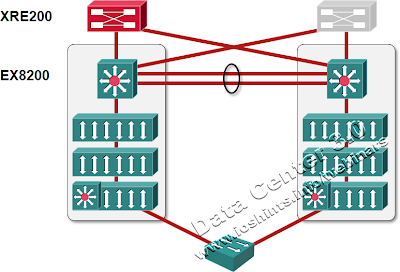 When you want to build a virtual chassis (Juniper’s marketing term for stack of core switches) out of EX8200 switches, you offload all the control-plane functionality (Spanning Tree Protocol, Link Aggregation Control Protocol, first-hop redundancy protocol, routing protocols) to an external box (XRE200). The resulting architecture is very similar to Cisco’s VSS, the major difference being that the internal routing engine in an EX8200 participating in a virtual chassis performs only the most rudimentary functions (chassis/linecard monitoring and maintenance). Theoretically you could scale the virtual chassis architecture to numerous EX8200 switches behaving like a single data center fabric. From that perspective, the virtual chassis approach is way better than Cisco’s VSS (which still looks like a hack to me). In reality, only two EX8200-series switches can be joined initially, making the virtual chassis a more expensive hack than the VSS (not only are you lobotomizing one supervisor module, you have to buy two more and lobotomize three out of four). Not surprisingly, Juniper’s white paper is full of not-so-subtle hints comparing virtual chassis with VSS. For example: if the inter-switch link (Juniper’s term: intra-chassis link) goes down, you don’t lose half of your switching capacity (like you do with VSS). What they forget to mention is that the most common reason you’d lose a well-designed inter-switch link implemented as a port channel of multiple 10Gb connections terminated on different linecards is the failure of the supervisor module (in which case half of your switching capacity is dead anyway). Furthermore, losing the inter-switch link between two Catalysts in a VSS system is equivalent to losing all the connections between the left- and right-hand sides in the above diagram, in which case the virtual chassis is at least as brain-dead as VSS (the whitepaper is curiously mum about that scenario). Another omission: when you lose the intra-chassis link between two EX8200 switches, hosts connected only to the left-hand switch (most probably) can no longer talk to hosts connected only to the right-hand switch. Last but not least, when trying to compare apples to apples (which you can never expect a marketing whitepaper to do), we should also consider the extra power supplies, fans and other infrastructure needed in the XRE200 boxes. [virtual chassis behavior at inter-switch link loss] is a significant advancement over other vendors’ solutions, where the loss of the intra-chassis link leads to complete loss in connectivity between any nodes (access switches or core routers) interconnected via the aggregation layer. Due to the current limitations, the virtual chassis offers no clear advantages over Cisco’s VSS or vPC solutions. However, the architecture (clean separation between control and data planes with numerous redundant paths between them) looks promising and once they manage to implement a reliable system beyond the two chassis, it will be a truly interesting solution. It looks like the EX8200+XRE200 virtual chassis is still a future, not a feature. I could find no EX8200-related information in the Virtual Chassis for the EX Series Switches JunOS documentation. Read the Benefits of Deploying Virtual Chassis Technology on the EX8200 Line of Ethernet Switches white paper from Juniper to get a few more details. Watch the Data Center 3.0 for Networking Engineers webinar (buy a recording or yearly subscription) to get an overview of new data center architectures, including multi-chassis link aggregation, port extenders and TRILL. What about MLAG on Cisco Nexus platform (vPC) where both control planes remain awake? Do all fears remain or that idea is step forward? Hi Ivan , there are some beta projects on Junos 10.4 and XRE200 since August. I think the key challenge in "virtual link aggregation" techniques is really the layer 2 forwarding part , especially when it comes to forward the traffic within the same broadcast domain. Sometimes you can run into some performance degradation issues if the flows are not varying enough on the mentioned above values. That capability has been available for quite a while; the problem is that the second supervisor in the chassis has to reload once the first one fails, bringing the whole chassis (and half of VSS) down for quite a while. do u know what happen if XRE200 is failure. I can not find any failure scenario document about this like cisco vss white paper in juniper. Juniper just recommend two XRE200 for HA, but not as a requirement. So if just equipped ONE XRE200 in virtual chassis, what happen with these two chassises? one still active and another become dead to prevent loop or .......? No idea. Best-case the switches would continue to forward traffic based on existing forwarding tables (and hopefully XRE200 would recover). Worst case, you'd have three dead boxes. One XRE is not supported. Two is required. "Furthermore, losing the inter-switch link between two Catalysts in a VSS system is equivalent to losing all the connections between the left- and right-hand sides in the above diagram, in which case the virtual chassis is at least as brain-dead as VSS "
"not only are you lobotomizing one supervisor module, you have to buy two more and lobotomize three out of four"
#1 - Agree with the "missing link" observation, although it doesn't change much. Conceptually it's still the same thing as VSS with multiple parallel links - if all links between left and right side fail, you have a problem. No way around that. #2 - "Lobotomizing supervisors": I see your point. It would be interesting to compare that with NSF from Cisco (VSS). Any good comparison documents or technical deep dive? #3 - I know the 4-chassis solution is supported now (thanks for pointing that out). That will be covered in the upcoming update to the Data Center Fabric Architectures webinar. daemons on both the master and backup and hence it needs the help of NSF aware (cisco) neighbors to maintain or rather rebuild the protocol states whereas the forwarding states are maintained, plz correct me on this if i am mistaken. in case of Juniper HA the backup RE is exactly running the same processes as the master and hence there is no need for repopulating RIB or anything and the forwarding states that are maintained in the Kernel are synced across the master and backup, the PFE (packet forwarding engine) on the LC keeps forwarding the packets hitlessly in case there is no protocol triggered change during the switchover, so you actually get a 0(zero) packet drop scenario when there is no protocol triggered changes happening during switchover.